The northwest corner of the National Mall could be considered the “War and Peace Corner” of our nation’s capital. It is home to this country’s most famous veterans memorials, which draw tens of millions of visitors each year. It is also home to the headquarters of the United States Institute of Peace (USIP), and to other symbols and sites with peace themes, which, while generally less prominent, offer an important and complementary narrative. The following Peace Trail on the National Mall is the result of a collaboration between USIP and colleagues at the Guild of Professional Tour Guides of Washington, D.C. and at the National Park Service. Anchored at USIP and tracing a path to a dozen other key sites in the vicinity, it brings a “peace lens” to the experience of visiting the National Mall. It may be used as a self-guided walking tour or a reference guide, elevating stories of key figures, institutions, and moments in history that demonstrate America’s enduring commitment to peace. The United States Institute of Peace (USIP) is an independent and nonpartisan institution that represents America’s commitment to peace around the world. Founded by Congress in 1984 and signed into law by President Reagan, USIP’s charter established it as a “living institution embodying…the concerns of the American people for peace” and declared it “an appropriate investment by the people of this nation to advance the history, science, art, and practice of international peace and the resolution of conflicts among nations without the use of violence.” USIP pursues its mission by engaging directly in conflict zones and by providing analysis, education, and resources to those working for peace. From efforts to promote peaceful elections in Afghanistan, to support for the peace process in Colombia, to developing ways to counter violent extremism in multiple countries, USIP is advancing national security interests and making peace possible. Its striking building is the headquarters for its work globally, and serves as a living monument to peace. The image of a dove, a traditional symbol of peace, is suggested by the design of the roof and is part of USIP’s seal, which is etched into the plaza in front of the building. At the top of USIP’s flagpole is another dove—a replica of the weathervane created as a symbol of peace at Mount Vernon, George Washington’s home, after the War of Independence. The Department of State is the oldest and most senior cabinet agency, playing the lead role in U.S. foreign affairs and promoting peace, security, and prosperity through its diplomatic relations with foreign governments and their people. Since its creation in 1789, State Department diplomats have carried out the president’s foreign policy and helped to build a more free, prosperous, and secure world. In all regions of the globe, the State Department uses diplomacy to keep local conflicts from becoming wider wars, to defeat terrorists and their organizations, to ensure weapons of mass destruction cannot threaten peace, and to build bonds of mutual understanding. The Department of State holds the Great Seal of the United States, which is featured on the doors and exterior signage of the building.  The olive branch and arrows denote the power of peace and war, and the eagle faces toward the symbol of peace. Under construction on the 21st Street side of the department, the U.S. Diplomacy Center will be a museum and education center dedicated to explaining to the public how American diplomats and American diplomatic activities promote the core ideals of peace, prosperity, democracy, and development to benefit American citizens and peoples around the world. On the west side of the Lincoln Memorial, clearly visible from that site and its vicinity, and at entrances to Memorial Bridge and Rock Creek Parkway, statues represent The Arts of War and The Arts of Peace. These gilded bronze equestrians each have two separate elements: The Arts of War, sculpted by American Leo Friedlander, depicts themes of “Valor” and “Sacrifice;” the Arts of Peace, sculpted by American James Earle Fraser, consists of “Music and Harvest” and “Aspiration and Literature.” The casting and gilding were a gift from Italy in the post-World War II era, and President Harry Truman remarked at the dedication in 1951, “Ever since the war, our two countries have been working together to preserve world peace.” The bridge itself, beyond the Arts of War, is a physical union of the north and the south of this country, a symbol of reconciliation, and a reminder of the commitment to peace and unity here at home. The design of the Vietnam Veterans Memorial was the result of a national competition in 1980 which called for a vision reflective in character, which would harmonize with its surroundings, include the names of all who died or remain missing, and make no political statement about the war. The winning entry came from a young architecture student named Maya Lin at Yale University, who later said that this apolitical approach “became the essential aim” of her design: “I felt that the politics had eclipsed the veterans, their service, and their lives. I wanted to create a memorial that everyone would be able to respond to, regardless of whether one thought our country should or should not have participated in the war.” The wall itself has inscribed in black granite and in chronological order the names of more than 58,000 men and women. Each year, the National Cherry Blossom Festival commemorates the 1912 gift of 3,000 cherry trees from the mayor of Tokyo, Japan, to the city of Washington, D.C. The gift brought to America a centuries-long tradition of celebrating the beauty of these blossoms, and sought to honor the enduring friendship between the United States and Japan, which is itself celebrated during the festival each year. After World War II, Japan made two further gifts: an ancient Japanese lantern, made in the 17th century and delivered and dedicated to the U.S. in 1954 to commemorate the 100th anniversary of the first treaty between the two countries; and a stone pagoda, which was dedicated in 1958 on the 100th anniversary of the 1858 Harris Treaty on trade and diplomacy between the two nations. The Japanese lantern is lit each year as part of the National Cherry Blossom Festival. Thomas Jefferson, the third president, is considered one of America’s Founding Fathers—a diplomat, a political philosopher, and the primary writer of the Declaration of Independence, which insists on universal equal rights, including to “Life, Liberty, and the pursuit of Happiness.” At the center of the memorial, the towering bronze statue of Jefferson is encircled by the quote: “I have sworn upon the altar of God eternal hostility against every form of tyranny over the mind of man.” Jefferson served as the first Secretary of State under President George Washington, making important contributions to America’s international relations in the form of agreements with Prussia and France. When he took office as president in 1801, it represented the first peaceful transfer of power from one political party to another in the nation’s young history. In his first inaugural address, he asserted that the “essential principles of our Government” included “equal and exact justice to all men…peace, commerce, and honest friendship with all nations…” During Jefferson’s time in office, he sought not to become embroiled in the Napoleonic Wars between Britain and France, though ultimately this effort was unsuccessful. Throughout his life, Jefferson’s private correspondence included many references to his passion for peace, consistent with his commitment to ideas of the Enlightenment.